The marketplace is flooded with different types of marketing automation software suitable for organizations of all industries and sizes. Despite the multitude of features and capabilities these programs offer, research has shown that many marketing automation investors experience initial failure (Hubspot does an excellent job of outlining why automation efforts fail here). The process of researching the characteristics and behavioral habits of a target market will vary from business to business, but it is absolutely crucial for determining how best to craft a personalized online experience for your customers. Ideally, your target market profile is detailed and highly visible in your workspace so that it is always front of mind. It should describe how the demand for your product/service originates within your customer (think need states), relevant interests, media consumption habits, and social behaviors. Furthermore, your research should reveal where your customers spend their time online (social media channels, websites, etc.). Articulating your target market and ideal customer need state will help guide search engine keyword research and help answer the question “what will my potential customers be searching for on google?” Knowledge of what keywords your customers are searching for on the web will also help guide search engine optimization measures for your digital content strategy. Your digital experience will be tailored to your customers, so it is imperative that you obtain an accurate target market profile so that you can focus on giving them what they want to see online! Ensure that your business has a defined focus/theme for blogging, and create standards for research, writing, and editing processes. Additionally, make sure to establish a policy for including “Call to Actions” in your digital communications. Experiment to learn which call to action techniques (email newsletter signups, downloadable content, social media “ask the audience” style questions, surveys, contests, etc.) resonate the most with your customers. Without content generation processes in place, businesses will spend time playing catch up gathering and creating everything necessary to populate their automation platforms. That is why before purchasing automation software, companies must be ready to continuously populate it with valuable content in order to realize its value and cover its cost. Now that’s a mouthful! But it’s accurate- businesses need to be thinking about how their prospects will interact with their brand through all stages of the sales funnel. Does the flow of your digital experience generate, nurture, and convert qualified leads? The goal of your digital content marketing initiatives should be to offer the right content to the right people at the right time, and doing so requires digital information architectures that accommodate the need states and interests of your consumers. Throw yourself in the minds of your customers and create flowcharts that illustrate their potential navigation paths through your brands’ digital platform. Design your website architecture to ensure users can navigate through your pages in a way that is intuitive and logical. 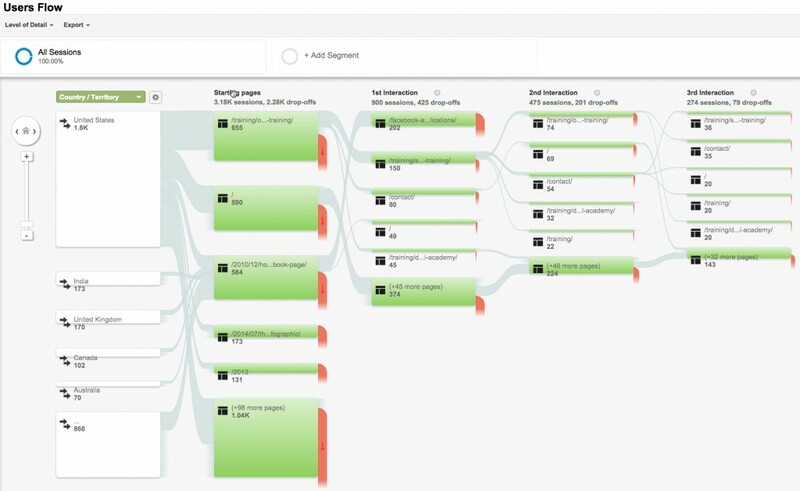 Analyze Google Analytics “User Flow” to see where your customers are coming from, where they are going, and look for opportunities to improve their experience by leading them to the most relevant and valuable information. If your digital assets are scattered and poorly linked, marketing automation software will not help keep your customers on and returning to your brand’s online presence. Keep your target market and customer need states front of mind to design an information architecture that leads people to the answers they are looking for. According to a June 2014 research survey conducted by OneSpot and the 614 Group, more than ½ of marketers in the US are not satisfied with their current content marketing efforts- citing poor performance in driving business results. The streamlined publishing and analytical capabilities of marketing automation platforms undoubtedly have great appeal to marketers who want to see more returns from their content strategies. The fact remains, however, that using these automation tools without necessary organizational processes and foundations will result in wasted time, money, and ultimately a disjointed digital experience for your customers. Make sure your business is prepared before taking the leap to automation!